Besides touting the design, driving and performance of the XC60, Volvo will trumpet the crossovers City Safety system. The system automatically depresses the brakes if it senses the driver is too close to another vehicle. Volvo says City Safety can help avoid crashes at 18 mph or lower. SAN FRANCISCO — Volvo says its new XC60 crossover will be competitive with other entrants in the growing segment, even priced just below $40,000. That's about $5,000 more than the Mercedes-Benz GLK, which went on sale this month. But John Maloney, vice president of marketing and product planning for Volvo Cars of North America, says the Swedish entrant in the luxury compact SUV segment comes only with all-wheel drive and has far more standard safety and luxury features. Volvo's sales targets for the XC60 aren't grandiose: a full-year goal of 10,000 to 15,000 units, says Michael Cottone, the brand manager. The XC60 goes on sale in mid-March. The XC60 will compete with the BMW X3, Acura RDX, Infiniti EX, and the Audi Q5 as well as the Mercedes GLK, which will be launched at about the same time as the Volvo. Cottone says the segment last year was about 60,000 units and is expected to grow with new entrants. How much it will grow depends on whether the automotive market emerges from its current slump and consumer confidence returns, he says. Volvo wants 15 to 18 percent of the segment, Cottone says. Nearly 60 percent of the sales of the XC60 are expected to be to conquest buyers. Volvo expects its largest market will be in the metropolitan New York/New Jersey/Pennsylvania area, which currently accounts for 16 percent of Volvo's annual U.S. sales, Maloney says. Buyers will include young families and couples planning families who live in urban areas. Maloney also expects sales to Volvo owners moving from the S60 sedan and larger XC90 crossover. Although Volvo will market the design, driving and performance of the XC60, safety will be a major selling point in new TV commercials that will start in March, Maloney says. 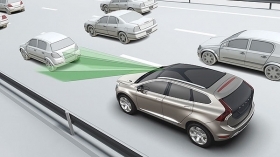 Volvo has put a new safety feature called City Safety on the XC60 as standard equipment. It's the first vehicle to get the system, which will be phased in through the range as cars are replaced. Using infrared laser technology, City Safety reads reflections off the surfaces and license plate of the vehicle in front and monitors distance. If the XC60 driver comes too close, City Safety will fully engage the brakes and bring the XC60 to a complete stop from 9 mph or under, and help the driver to avoid a crash at 18 mph or lower. Volvo executives say most accidents happen at speeds of 18 mph and lower.